Marketing leader Roland Smart has provided marketers with a step-by-step guide for how to adopt more customer-centric, hands-on; AGILE strategies. As customers become harder to please, a truly positive customer experience has become harder to deliver. The marketing world has had to twist and reshape to accommodate new concepts and emerging innovation. Gone are the days of annual planning and instead marketers are adopting more agile and lean approaches to align with the fast paced nature of modern day-to-day lives. 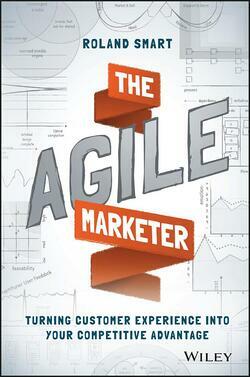 Roland Smart's The Agile Marketer takes these complex marketing strategies and makes them easy to understand. For every marketer trying to get that ever-important competitive advantage, this book will shine a light on new concepts, new strategies and why the customer experience has become the holy grail of marketing. In our most recent episode, we got Roland to tell us more about his agile approach, discuss his book The Agile Marketer, and dish on what's happening in the industry. Roland's book is not the first to explore the line between customer experience and a strong competitive advantage but it is unique in its focus on improving customer experience through an agile marketing approach. Similar to the lean approach, agile thinking is all about streamlining a brand's marketing function. One of the core focuses of our interview was Roland's recent departure from Oracle as VP of Social & Community Marketing. His new role as VP Marketing at Pantheon is a shift from the corporate world at Oracle and we unashamedly pressed Roland for all the deets. We also couldn't resist getting Roland's opinion on Samuel Scott, whose article last year- "Agile Marketing is a crutch for those who do not have a real strategy"- caused quite a tailspin. Checkout other marketing & tech books from our #marketingbookclub. Copyright © 2018 MarTech Alliance™ All Rights Reserved.